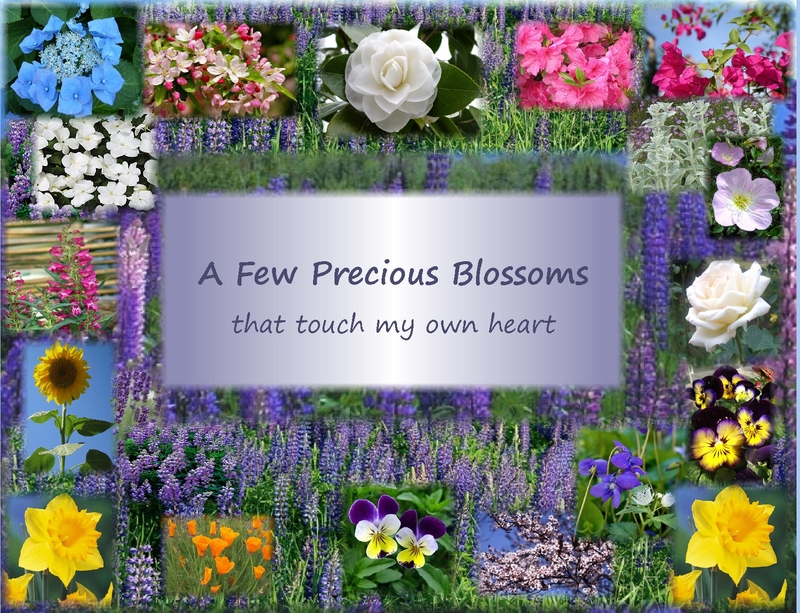 A few precious blossom that I love…. 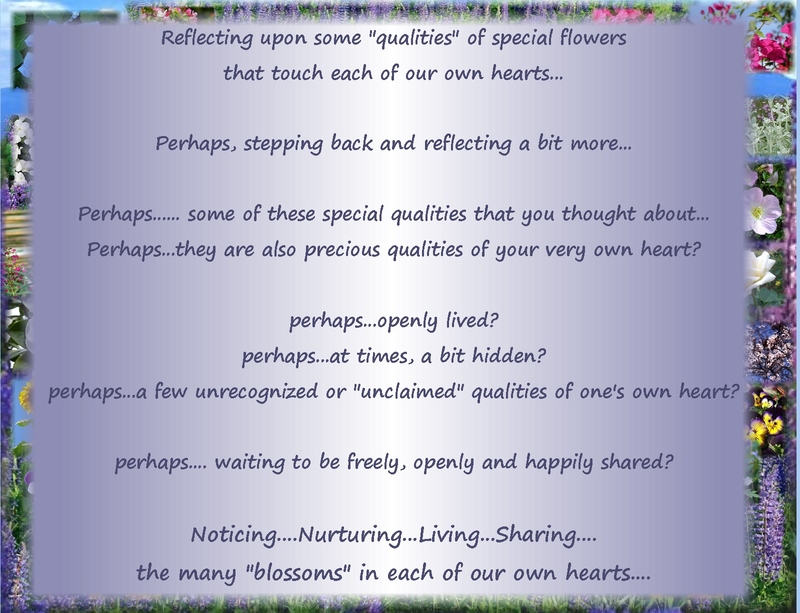 “qualities” that perhaps are just waiting to be nurtured and lived? 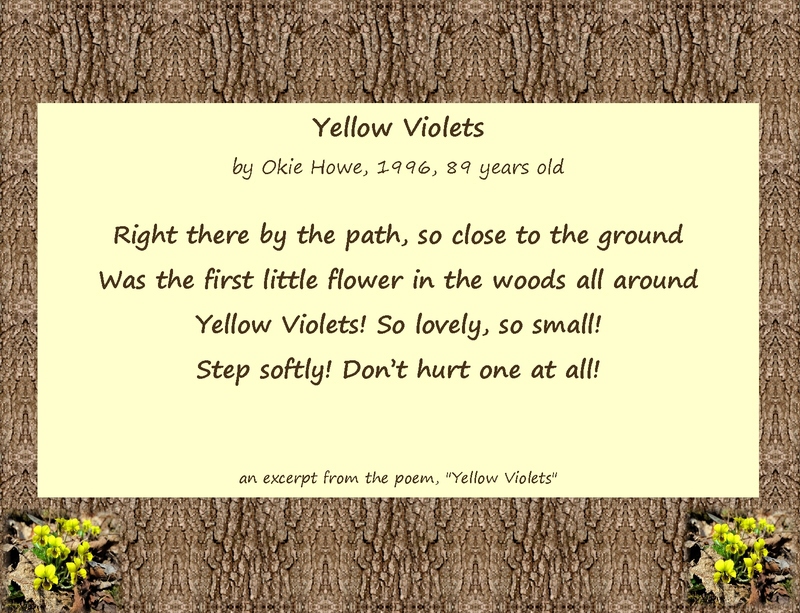 I thought about this idea last week, after reading “Yellow Violets”... a special poem by my Aunt Okie, who died a few weeks ago at 98 years old. 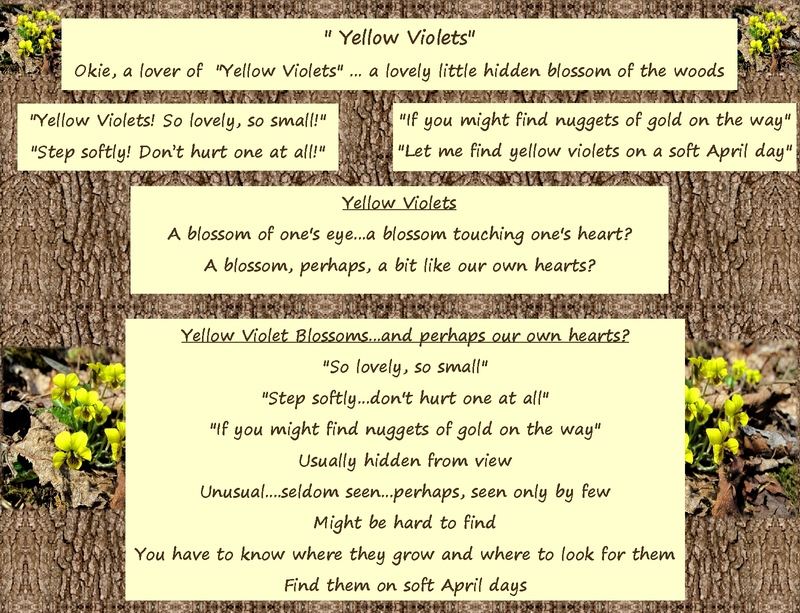 “Yellow Violets! So lovely, so small! Perhaps a clue about her own precious heart? seen by only a few? But of course…perhaps I’m only reading in “clues” about my own heart? Watching for those “clues” about precious qualities I may not show to others? 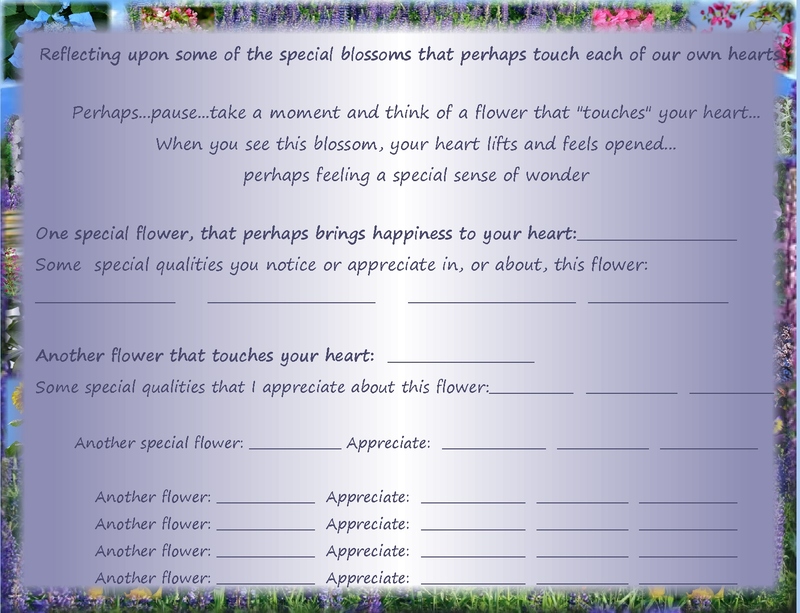 Using our love of certain flowers…to find clues about our own precious hearts. One of the positive intentions in looking for these clues? 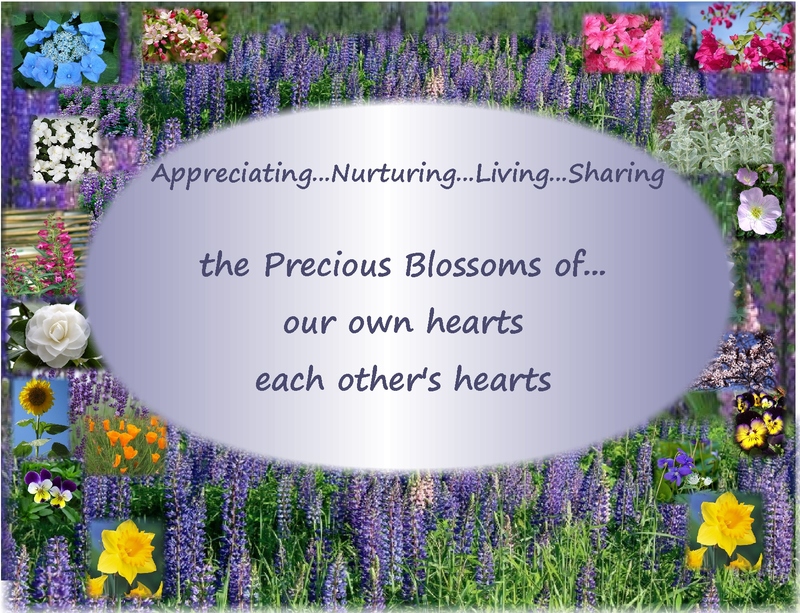 the precious blossoms of each of our own hearts! 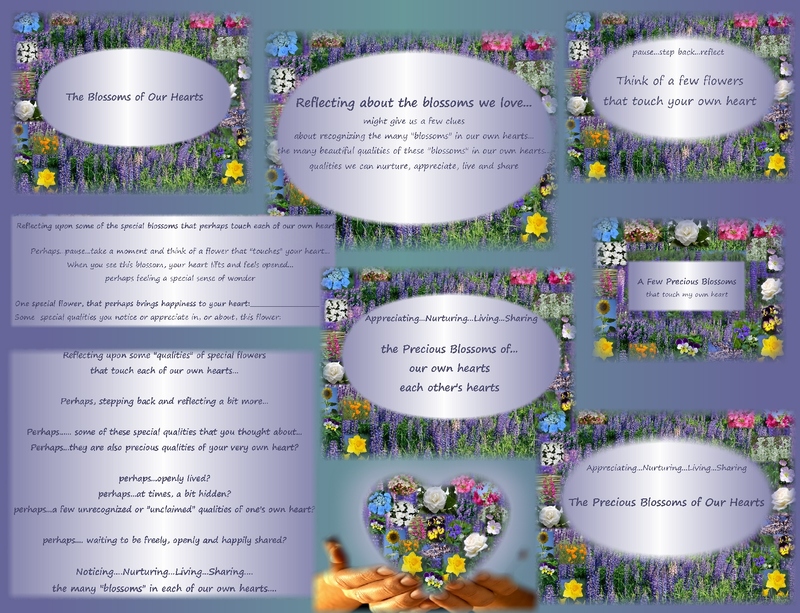 Part of Nurturing Thursday, hosted at Becca Given’s blog, On Dragonfly Wings with Buttercup Tea. 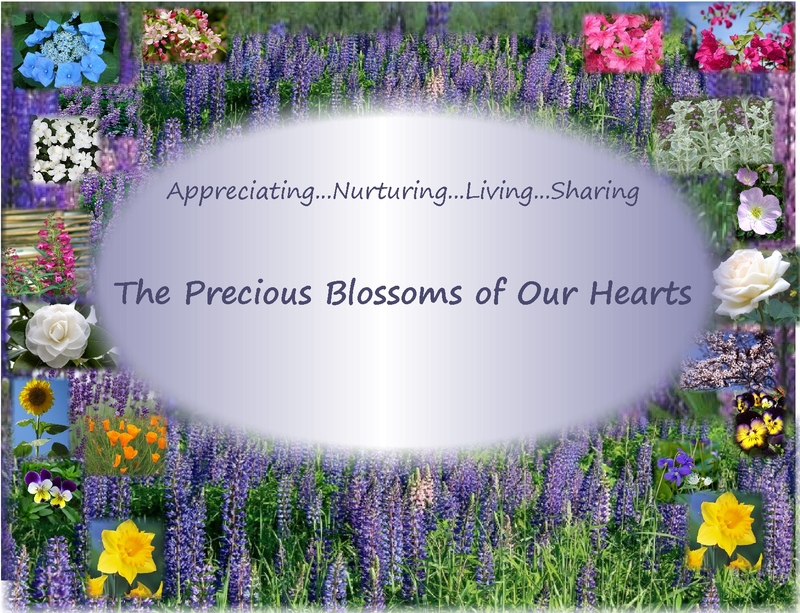 Please visit Becca’s blog for Becca’s Nurturing Thursday post and for links to posts by other Nurturing Thursday participants. 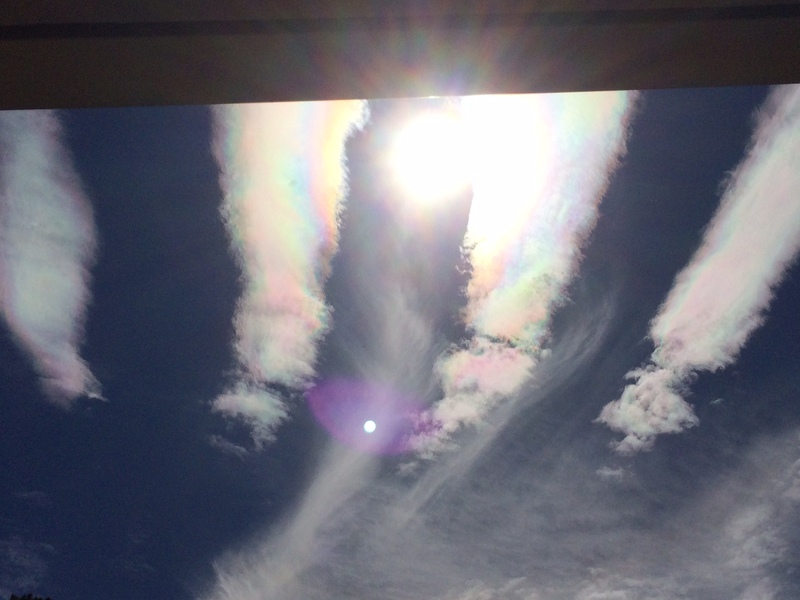 15 minutes later: Oh my goodness….there are iridescent clouds above our house…7 strips of clouds with iridescent rainbow colors along the edges of each cloud…WOW!!! This entry was posted in Appreciation, Life and tagged Awareness, Beauty, Encouragement, Gratitude, Happiness, Inspiration, Intention, Life, Love, Loving kindness, Mindfulness, Nurturing, Spirituality, Wisdom. Bookmark the permalink. 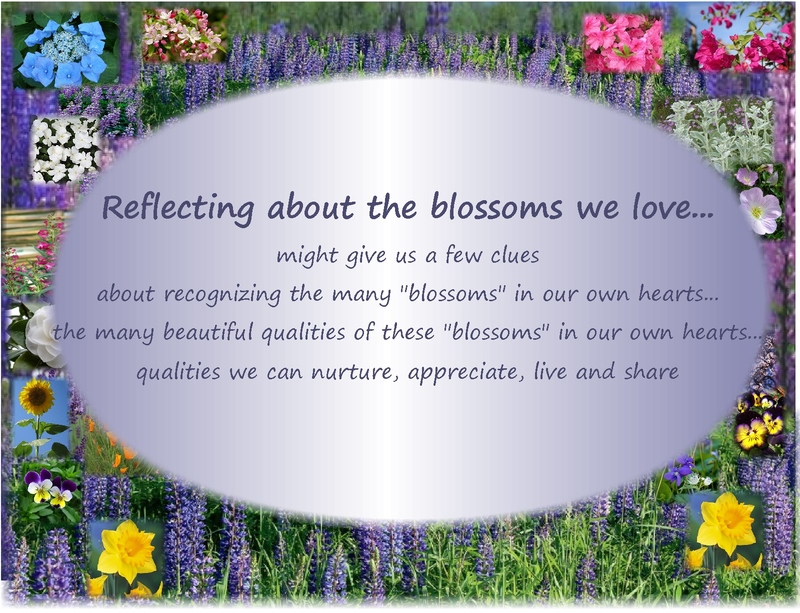 13 Responses to The Precious Blossoms of Our Hearts…noticing, nurturing, living and sharing…. Yes, there are clues in all the little everyday things that we see and appreciate — just a matter of taking the time to notice and reflect on them, as you say! Thank you, Robin… I seem to have moved from quiet sadness to an even deeper sense of the exquisite beauty of nature, (“the sacred beauty of the everyday”…I think that those are your words! 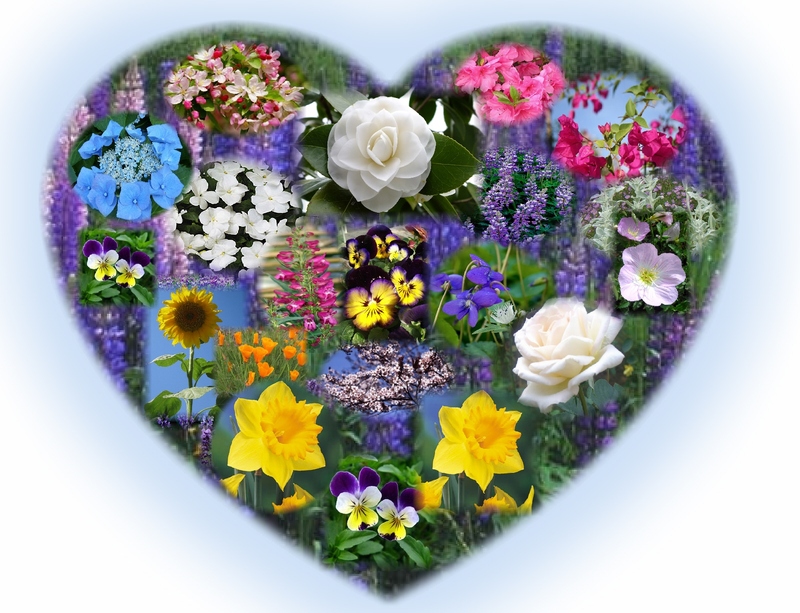 ), the human “heart” or “spirit”…. 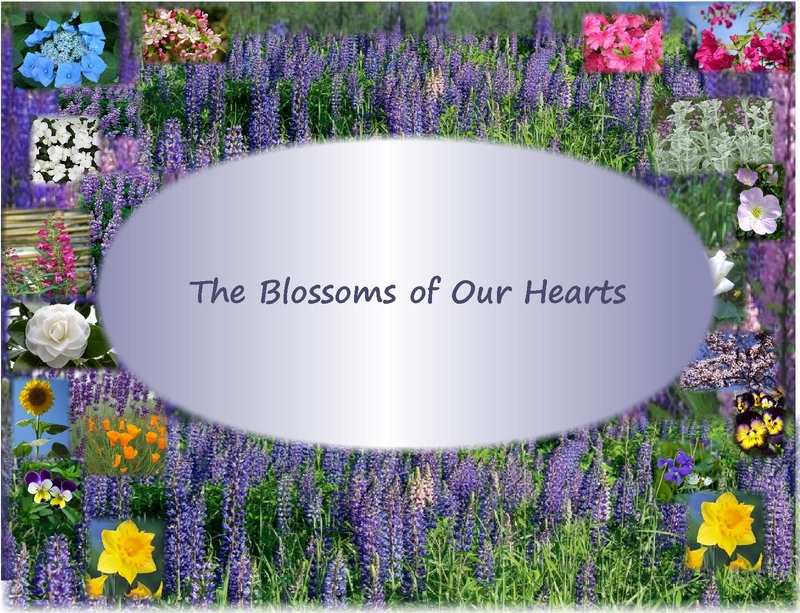 and everything I see and perceive throughout the day… including the “blossoms of our hearts”…for me, that would be to hold very gently the exquisite beauty and vulnerability of each of our own hearts. She also has intriguing descriptions about her own awarenesses about what “ideas” “are”… ..which, of course ties in with each of our own “ideas” and creating each of our own unique kinds of posts about those “ideas”…. Oh dear, this comment got longggggggggg….oh well…it’s such an intriguing idea! And, Robin, I thought you might enjoy the “amazingness” of Elizabeth Gilbert’s ideas! I’ve had several very odd-seeming and VERY, VERY WONDERFUL “coincidences” after reading her 2 previous books…tying in very closely with each book. 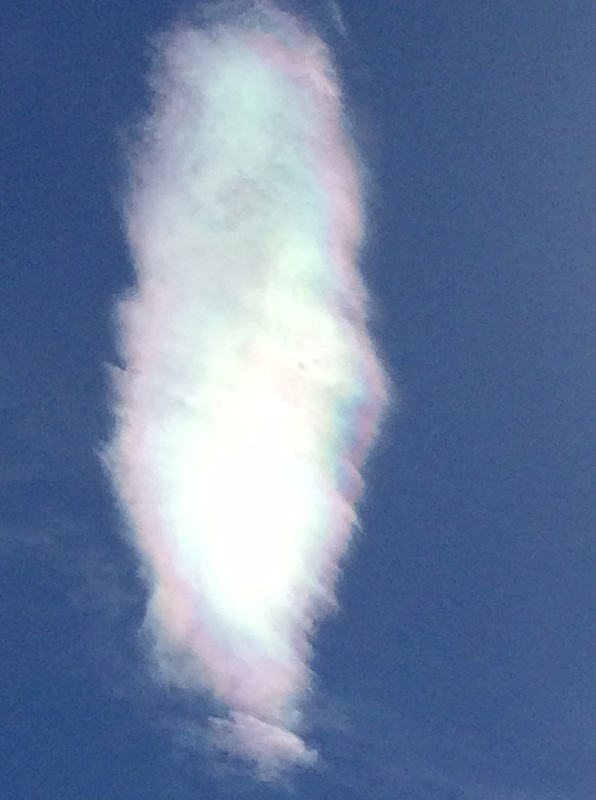 I wonder if more happy or amazing opportunities…Big Magic???…. might happen/arise after reading, enjoying and reflecting upon her new book????????? woooooooo…who knows???? 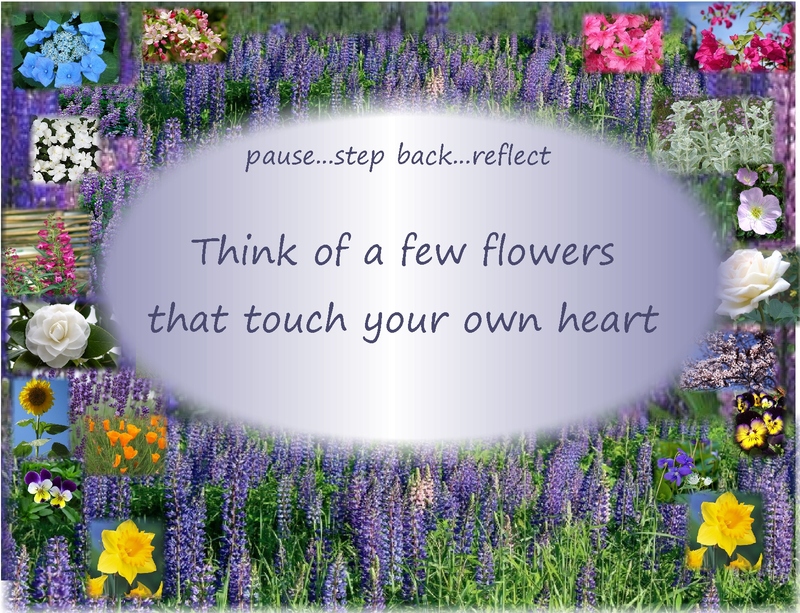 Pingback: Nurt Thurs – Skills | "On Dragonfly Wings with Buttercup Tea"
This reminds me of “gather ye flowers while ye may” which may, however be misquoted and may be Shakespeare!